Mike Mearls working on Nentir Vale material! 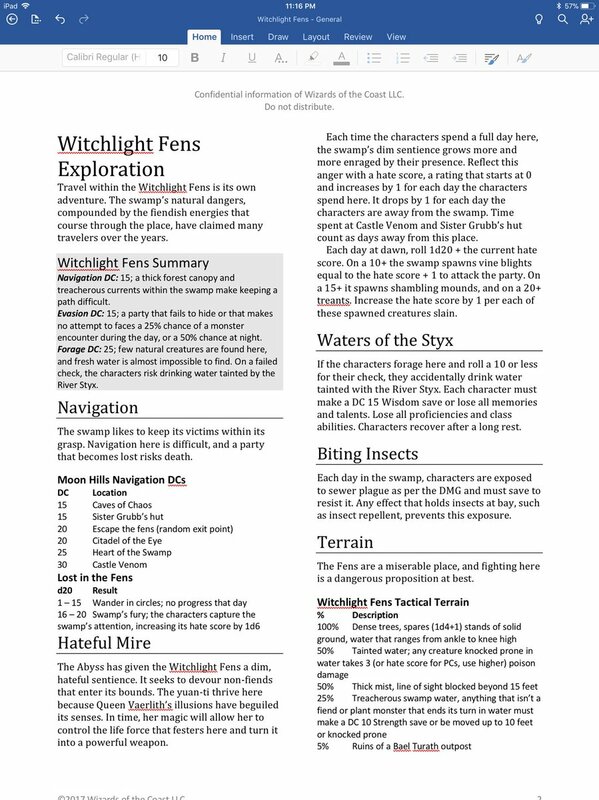 Don't get too excited, as it looks like this is just his home game, but Mike Mearls has been posting about reference sheets he has been designing for his Nentir Vale campaign! Mike Mearls on Twitter wrote: I talked a few days back about changing up outdoor exploration, here’s my first stab at it. Quick draft, concept is that the key is to make regions more interesting. Here’s reference sheet for the Moon Hills for my Nentir Vale campaign. 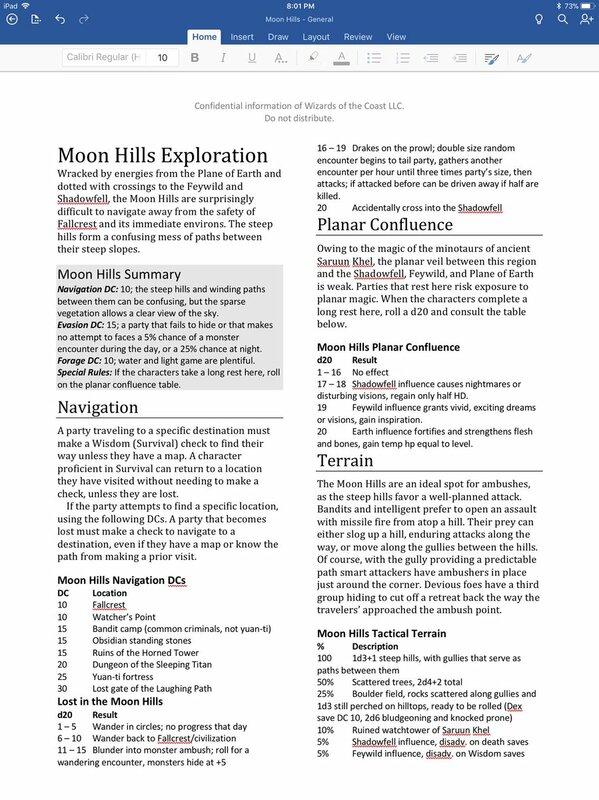 He attached a screenshot of his Moon Hills Exploration but not the entire document. Mike Mearls on Twitter wrote: Follow-up to the outdoor exploration example from last night. Another region of the Nentir Vale, this one much more dangerous. Alterations I’ve made to the Vale poke through a bit more here. And yes, have noticed the disclaimer. Word uses my work template by default. There was a Witchlight Fens Exploration screenshot attached to that post. I wonder if he will ever release the entire documents. Re: Mike Mearls working on Nentir Vale material! I like it. This type of treatment could be helpful for any setting, but it's particularly fun to see it for Nentir Vale. Tim Baker wrote: I like it. This type of treatment could be helpful for any setting, but it's particularly fun to see it for Nentir Vale. Frustratingly, we can't see the entire documents. And I don't know what else Mike Mearls has been working on. I hope these get put up on the D&D website. I hope they release this as an UA article or something. I'm canoning that the minotaurs of Sarhuun Khel used portals near the Moon Hills, though. You can get excited now! Zeromaru X wrote: I hope they release this as an UA article or something. I'm canoning that the minotaurs of Sarhuun Khel used portals near the Moon Hills, though. Thanks for sharing that. I hadn't seen anyone mention it until now. Personally, I don't see the necessity to change the lore of 4e to match's 5e lore... but to each its own, I guess. If this mean they are going to acknowledge Nentir Vale as a proper setting alongside the classic ones, then I will be happy. That's the way I think of it as well. I can ignore the changes, if I want, and if the world gets expanded upon, and they tell new stories in the world (and open it up to the DM's Guild for others to share their stories as well), I'm optimistic that would be a positive thing. Additionally, while I might not want to include some of the changes that have already been released (Raven Queen) or previewed (Mike Mearls' tweets), I at least feel like Mike Mearls understands the tone of the setting and is wants to maintain it, even if the details are different. Mike has shared his take on Erathis. As one of these 4e deities that didn't got any background lore back in the day, I really appreciate this! Great find! I ran a Nentir Vale campaign where the Church of Erathis featured heavily. I think it may have been the first time I used a non-evil organization as villains in a campaign, which made it far more complex than the standard enemies the players had faced. In my campaign, the church was taking the cause of expanding civilization and order too far, and had used this philosophy to subjugate the fey and promote the extermination of creatures that the church deemed unable to be civilized. Mike has been releasing more of his work on Twitter. This time is Avandra, Kord, Melora and Sehanine's turn. Awesome find! Ah, Kord. My wife's first 4e character was a paladin of Kord. I've had a soft spot for that deity ever since. "I’d love to. Matter of timing and bandwidth. Slow but steady." Okay, NOW I AM GETTING EXCITED!!! DANGIT MIKE, WHY DO YOU DO THIS TO ME??????? ?